Lalvin ICV-D47 is a Côtes du Rhône isolate for the production of complex whites with citrus and floral notes, and for full-bodied, barrel fermented Chardonnay and other white varietals. When left on lees, ripe, spicy aromas with tropical and citrus notes are developed. 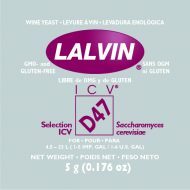 Lalvin ICV-D47 is a high polysaccharide producer known to accentuate fruit characteristics and bring volume and complexity to white wines. Rehydrate Lalvin ICV-D47 in 5 times its weight of water at 40°C. Let stand for at least 20 minutes then gently stir occasionally to break up any clumps. Add to the must.